And then there were three. Following the Volkswagen Up and SEAT Mii, Skoda is launching its own version - the Citigo. 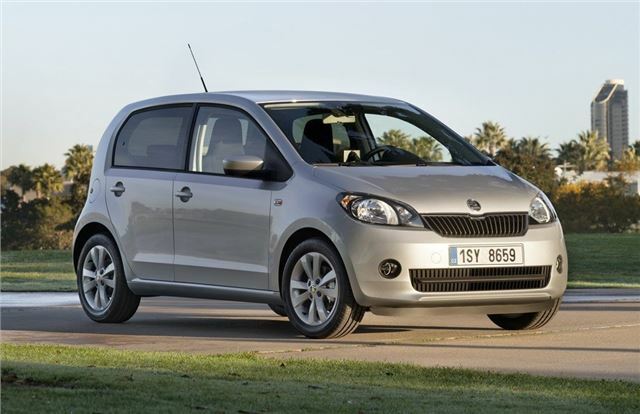 This is the first time we’ve been able to test the five-door version of any of them and it’s likely to account for about three quarters of all Citigo models sold (and Up and Mii for that matter). The body is identical in shape and size to the three-door so it's still just 3.5 metres long and ideal for busy towns and cities. 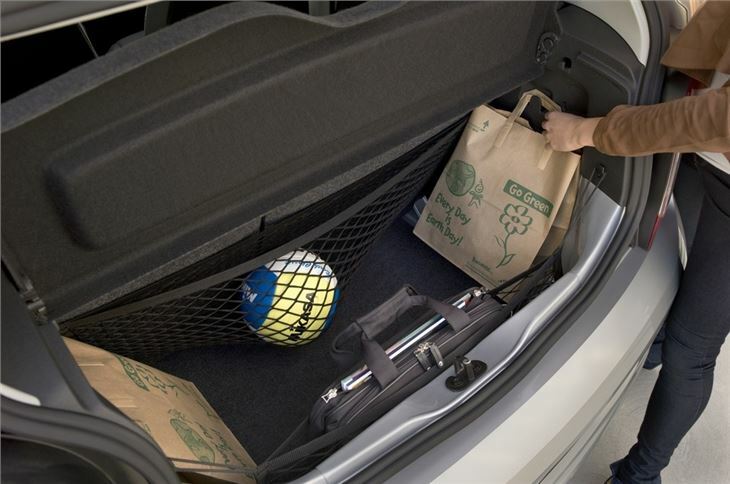 Adding the extra back doors makes it much more viable as a second car for families with young children as it's much easier to get to the rear seats. There's decent room too and even adults will find it reasonable in the back. 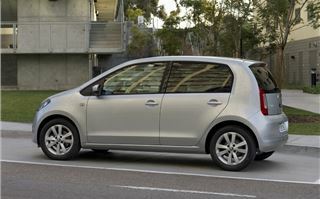 Sitting in the Citigo, it certainly doesn't feel as small as it looks. This is one well packaged design. There's plenty of space for both driver and passenger and lots of storage too. Along with a good sized glovebox there are bottle and cupholders and a clever 'multimedia holder' down by the gear lever. 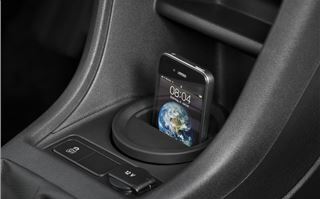 It's basically moulded soft rubber with a square slot that's ideal for mobile phones or iPods. The overall quality and finish of the interior is very good. The line-up is very simple with effectively just one engine, a 1.0-litre petrol that comes in two versions, one with 60PS and one with 75PS. It’s a three cylinder engine so has plenty of get up and go from low revs, despite a modest torque figure of 95Nm, and revs freely so it’s happy to whizz in and out of traffic without sounding strained. It’s helped by a great five-speed manual gearbox that has a nice positive shift to it allowing you to make the most of the Citigo’s characterful little engine. An automated manual gearbox called ASG will also be available as an option. 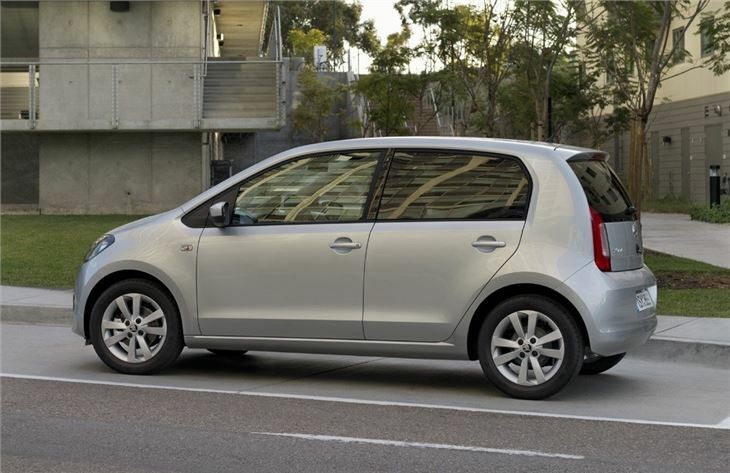 As you’d expect the Citigo is really well suited to urban driving with nice easy steering, good all round visibility and a tight turning circle. And you can slot it into seemingly impossible parking spaces thanks to the fact it’s so short. 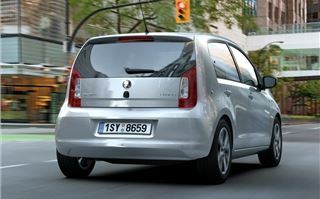 But what impresses is how adaptable the Citigo is. Get out of town and onto a main road and it feels like a much bigger car. It’s refined, quiet and doesn’t feel at all strained at motorway speeds. In fact it’s even better here. It easily keeps up with faster flowing traffic and has a surprising turn of pace when it comes to in gear performance – not something you’d expect in a car designed for the city. It’s even happy being thrown into corners, with admirable grip from its little tyres and very good body control. When it comes to performance there’s little to choose between the two engines in everyday driving. The official 0-62mph time is 14.4 seconds for the lower powered model while the 75PS version is 1.2 seconds faster. However, you only really notice any difference right at the top of the rev range or on long inclinces with a few passengers on board. Both are economical too with the standard 60PS version averaging a claimed 62.8mpg with CO2 emissions of 105g/km. But for real frugality it’s the Greentech versions - a sort of halfway house to Skoda’s full fuel-saving Greenline models – that lead the way. You can get the 60PS engine as a Greentech model while the 70PS version comes with it as standard. One of the main extras is an engine start/stop system that comes on Elegance models (confusingly it's optional on the 60PS SE) and automatically stops the engine when the car is stationary and the gearbox is in neutral. It then starts again when you press the clutch. Along with a lower ride height, brake regeneration and low rolling resistance tyres it helps to reduce fuel consumption to a claimed 68.9mpg on the 60PS with emissions of just 96g/km meaning zero VED. It’s the same story with the 75PS Greentech which averages 67.3mpg and emits 98g/km. So what about price? 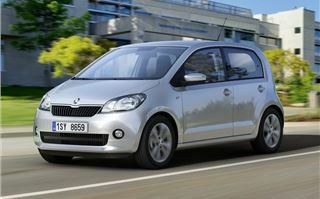 Well Skoda has yet to officially announce details but the Citigo is expected to start at around £7500 – similar to the Mii and cheaper than the Up. It’s well equipped for that money with standard kit plus there are some upmarket options too including heated seats, parking sensors (not that you need them on a car this small) and a neat panoramic sunroof. There’s also a portable sat nav system which comes as standard on Elegance models (it’s optional on S and SE). 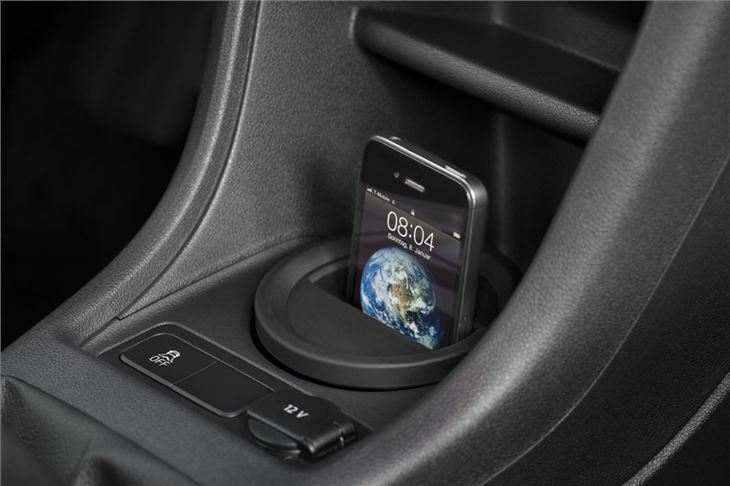 It sits on a dock on the dashboard so there are no ugly wires trailling about but can still be removed when you’re not using it. 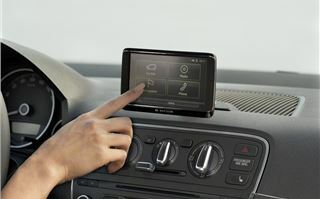 The navigation itself isn't the best around nor the most intuitive but the system does also include Bluetooth and an infotainment system and an on-board computer. 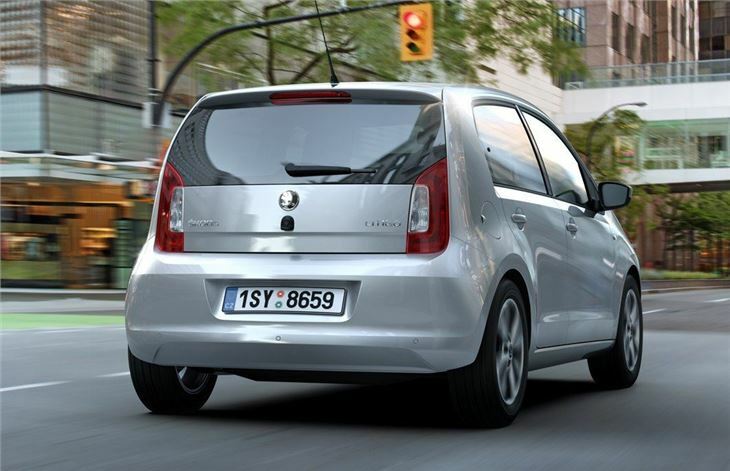 Safety is impressive with a five-star Euro NCAP crash test rating and the Citigo is the first Skoda to come with a head-thorax side airbag for the driver and passenger. A new City Safe Drive system is available as an option which uses a laser to detect objects ahead. If there's a danger of colliding with something it will automatically slow the car down. It works up to 19mph. 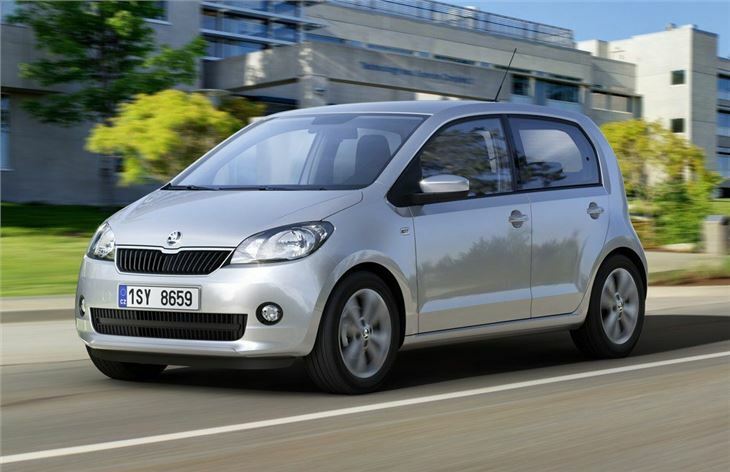 If you're after a small yet spacious and practical hatchback, the Citigo ticks all the right boxes. It feels well built with a good quality interior, plus it's enjoyable to drive and comfortable. This is one really well thought out and cleverly packaged small car. It goes on sale in June with both three and five-door models available from launch. SEAT version of the Volkswagen Up, powered by low emission 1.0-litre engine which emits below 100g/km CO2, easy and fun to drive, good value for money.